Hooray! My blog has been viewed over 100,000 times. Five years ago when I started writing these posts in an attempt to motivate my creativity I never thought so many people would be interested in my little musings on doll repair, essential oils, cooking, and gardening! I want to thank you all for reading and responding. Besides making me more accountable and less likely to slack off, I have gained so much socially through this blog. Some of you have become my very good friends! 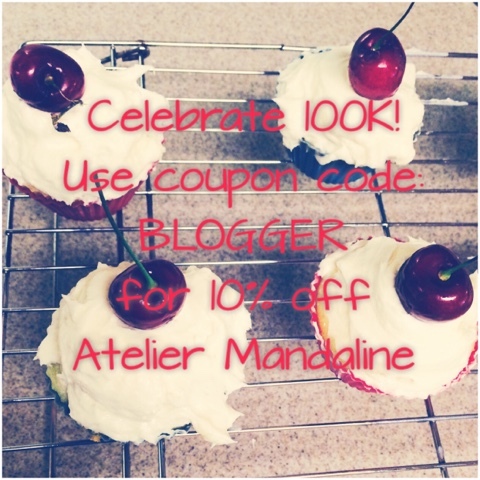 Please accept a discount of 10% in every Atelier Mandaline store: on Etsy, Facebook, and eBay through July 5th. The eBay discount is a coupon-less sale; use the coupon code BLOGGER on Etsy and Facebook for your discount. Even Young Living got in on the act! 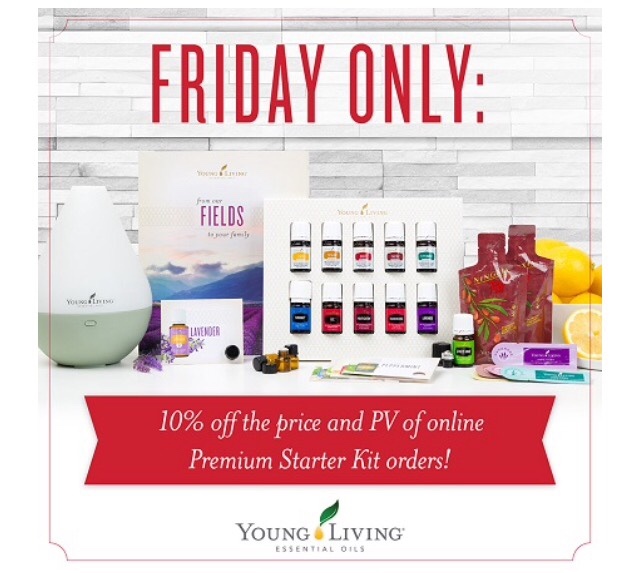 Take 10% off the Premium Starter Kit when you sign up as a new member through 6/30/16 (TOMORROW!) at midnight. 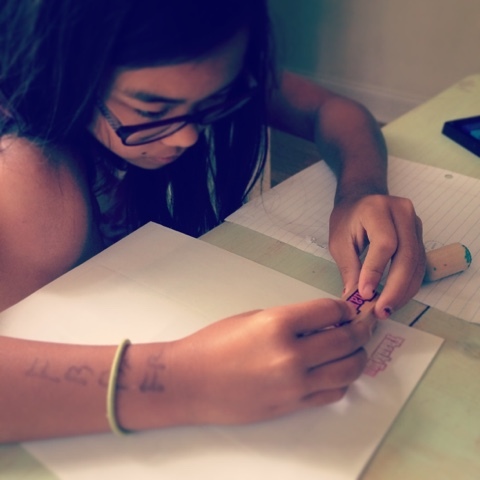 My daughter was hard at work today creating hand-stamped Thank You stickers for my customers. Make sure to place an order to get yours at a discount! My daughter makes handmade stickers. Summertime, especially here in the South, means more skin gets exposed than we might wish, just from sheer necessity. It's just too hot to wear too many clothes! For me, and I suspect for many others, this isn't a great thing. I am not as young or thin as I once was and pregnancy left my skin scarred with stretch marks. Fortunately, there are some things you can do to smooth your skin and get it summer-ready. Exfoliation is one key to pretty skin. Your skin constantly sheds dead cells, and these can build up on the surface, clogging pores and keeping moisture from absorbing. When you exfoliate you open up the skin's surface, allowing any moisturizer to penetrate more deeply. Essential oils are another terrific tool for skin care. The concentrated nutrients in certain oils can help smooth out the appearance of scars or help expel toxins that become trapped in fat cells, leading to lumpy cellulite. Here's a formula with a tropical base to help you pamper your way to smoother skin. Tonight I'm making a smoothing body scrub with essential oils that help combat three skin issues: cellulite, stretch marks, and sagging. Geranium and eucalyptus oils help smooth skin, reducing the appearance of scars. Ledum and Cypress help the lymphatic system clear out toxins that exacerbate the appearance of cellulite. Patchouli, Citrus Fresh, and Tangerine help tighten saggy or dimpled skin. You can choose a couple different methods when making this body scrub. 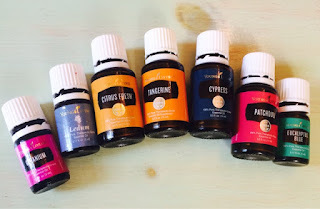 You could use one or two of the oils shown above for one use and then substitute other oils for the next use. Switching out products keeps your body "on its toes" and prevents it from building up resistance to certain products. Or, you could do a nutrient "bomb" and use all the oils at once to really maximize one treatment's effectiveness. Coffee grounds and coconut oil form the base. Women in tropical regions have learned to use the abundance of nature in their skin care. We can all benefit from traditional tropical beauty treatments, and science shows they really are as effective as the products you buy from the store. 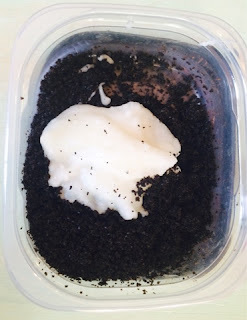 In this case, the scrub's base of coffee grounds and coconut oil tightens, exfoliates, and moisturizes all at once. 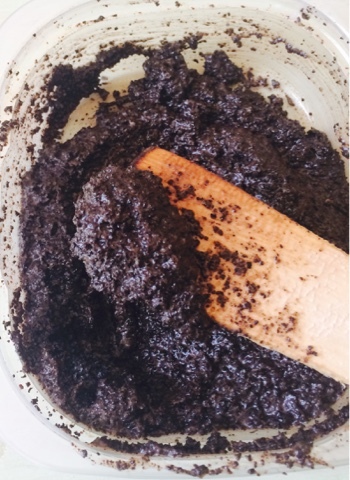 The coffee grounds scrub the skin's surface and the caffeine in the beans firms up skin. Coconut oil quenches dry skin's thirst. This scrub is a great opportunity to set aside some pampering time for yourself, especially necessary when the kids are home all day from school! Here's how I do it: First, mix the coffee grounds, coconut oil and about three drops of each of the essential oils until they form a paste. 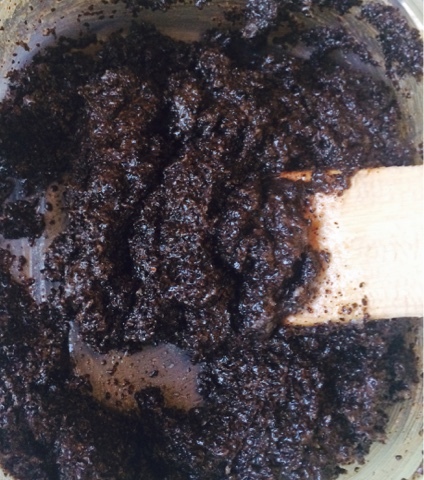 You can re-use coffee grounds after you make a pot of coffee, which is a great way to recycle them outside of using them for compost, or use fresh ones. The fresh grounds make a more abrasive scrub. Set up a book you're reading or put on some music. Pour yourself a glass of wine. Sit in the dry, empty bathtub and begin rubbing the scrub into your skin, one section at a time. If the scrub feels too abrasive, wet your hands and before you apply it. Keep rubbing the scrub into your skin for about 10 minutes. Then fill the tub with the hottest water you can stand and soak off the scrub. If you can, add to cups of Epsom salts and a few more drops of the essential oils to the water to help draw out as many toxins trapped in your cells as possible. Soak for at least 20 minutes. After your bath, dry off and apply your favorite lotion or for even more tightening power, Young Living Cel-Lite Magic massage oil and drink 16 ounces of water with grapefruit or lemon slices or a few drops of Citrus Fresh essential oil to help further flush out your body. Voila! You will feel relaxed and your skin will look fantastic. Repeat the scrub a few times a week if you can. It's a great pre-bedtime ritual. If you make more scrub than you need for one use store the excess in a glass container in the fridge. 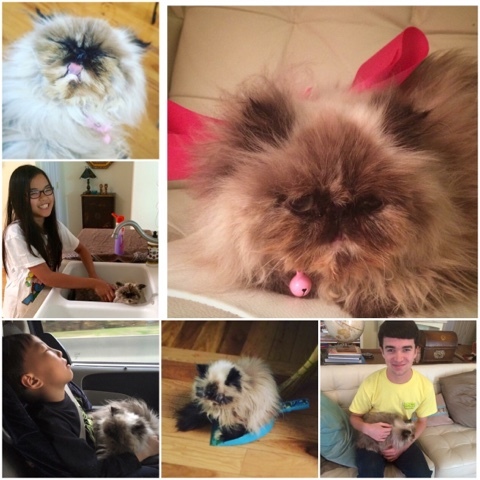 You probably remember my sad last post about our dead cat. Although we are still grieving for her, we ended up going to the animal shelter to look for another pet. Our youngest was so distraught I was worried he would make himself sick crying for his lost cat. When we got to the shelter we found out they have so many cats they are offering adoption fees of only $20, which includes spay/neuter, microchip, and a free month of pet health insurance. This is the Lincoln County Animal Shelter in Lincolnton, NC if you're interested in adopting a cat. In light of the overcrowding we decided to adopt two cats: a tortoiseshell kitten named Coco Puff and an adolescent Himalayan/Siamese mix who we named Ming after my childhood Siamese cats, Ming I and Ming II. 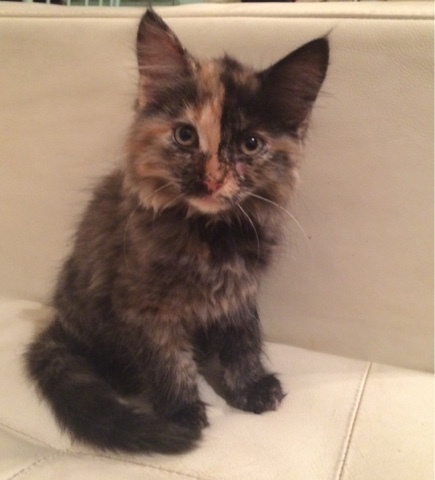 The Himalayan wasn't immediately available to bring home, so I will have to post photos of her later. I'm glad the kids are happier now, and I like cats well enough, but I will tell you, after the trauma of losing our sweet Snickers and a week of swim team and working and having the kids all home all day and now having become the owner of three cats, two dogs, and a bird I am ready for a pampering scrub! As always, to learn more about oils or purchase from me, please visit my Naturally Amanda Facebook page. 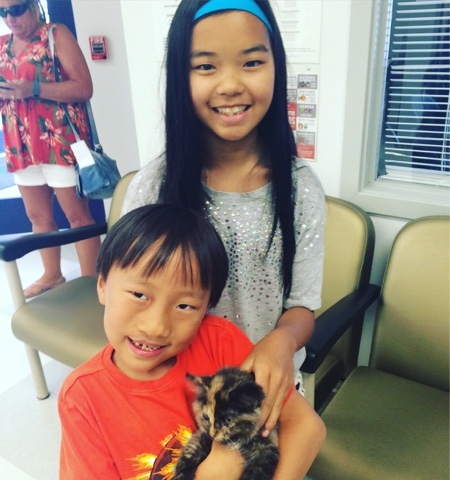 The younger kids with their new kitten. For those of you who follow this blog, I am very sorry to have been away so long. I've been swamped with the end of the school year stuff and then the kids started swim team without even one day's break. If you've read these posts for a long time you might remember we adopted a Himalayan cat in November. Although the Humane Society told us she just had a "cold" she turned out to have a chronic illness called FHV. She had a flare-up a few weeks ago and has been on medicine but wasn't really getting better. Then, while brushing her out the other day we found an enormous, bloody, egg-sized mass on her chest which had not been present only a month ago. Today the vet confirmed my fear that she was just too frail to undergo surgery, given that the aggressive nature of the tumor meant it had probably spread throughout her body. So we said goodbye to her this morning, in between swim practises and shipping and tonight's swim meet. I am exhausted from grief and activities. As soon as I can I will get back to work. 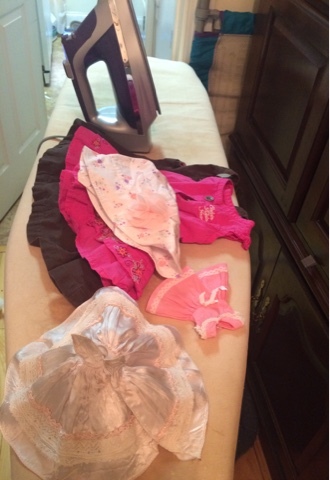 I have actually been quite busy listing a huge consignment lot of baby clothes in my eBay store. I am listing girls' right now but have lots of boys' already listed and coming soon. In the Etsy shop I have added several Skipper and Betsy McCall outfits. These are not tagged items, so they are quite affordable. I hope you'll check both shops and the Facebook page to keep up with all my activities. I will certainly let you know when I have a chance to finish a few new dolls. I have enough of them waiting on me!